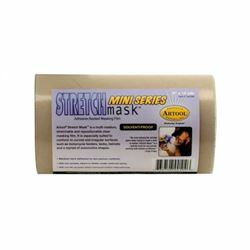 Artool Stretch Mask, 6"x10yds Roll, is a stretchable, flexible masking film. It's especially suited for curved surfaces like helmets, motorcycle tanks and automotive surfaces. It is a clear, thin, SOLVENT PROOF film that is easy to cut and reposition.